Holocaust trains were railway transports run by the Deutsche Reichsbahn national railway system under the strict supervision of the German Nazis and their allies, for the purpose of forcible deportation of the Jews, as well as other victims of the Holocaust, to the German Nazi concentration, forced labour, and extermination camps. Modern historians suggest that without the mass transportation of the railways, the scale of the "Final Solution" would not have been possible. The extermination of people targeted in the "Final Solution" was dependent on two factors: the capacity of the death camps to gas the victims and "process" their bodies quickly enough and the capacity of the railways to transport the victims from the ghettos to extermination camps. The most modern accurate numbers on the scale of the "Final Solution" still rely partly on shipping records of the German railways. The first mass deportation of Jews from Nazi Germany occurred in less than a year before the outbreak of war. It was the forcible eviction of German Jews with Polish citizenship fuelled by the Kristallnacht. Approximately 30,000 Jews were rounded up and sent via rail to refugee camps. In July 1938, both the United States and Britain at the Évian Conference in France refused to accept any more Jewish immigrants. The British Government agreed to take in the shipment of children arranged by the Kindertransport scheme, some 10,000 eventually arriving in the UK. All European Jews trapped under the Nazi regime became the target of Hitler's "Final Solution to the Jewish Question". Within various phases of the Holocaust, the trains were employed differently. At first, they were used to concentrate the Jewish populations in the ghettos, and often to transport them to forced labour and German concentration camps for the purpose of economic exploitation. In 1939, for logistical reasons, the Jewish communities in settlements without railway lines in occupied Poland were dissolved. By the end of 1941, about 3.5 million Polish Jews had been segregated and ghettoised by the SS in a massive deportation action involving the use of freight trains. Permanent ghettos had direct railway connections, because the food aid (paid by the Jews themselves) was completely dependent on the SS, similar to all newly built labour camps. Jews were legally banned from baking bread. They were sealed off from the general public in hundreds of virtual prison-islands called Jüdischer Wohnbezirk or Wohngebiet der Juden. However, the new system was unsustainable. By the end of 1941, most ghettoised Jews had no savings left to pay the SS for further bulk food deliveries. The quagmire was resolved at the Wannsee conference of 20 January 1942 near Berlin, where the "Final Solution of the Jewish question" (die Endlösung der Judenfrage) was set in place. It was a euphemism referring to the Nazi plan for the annihilation of the Jewish people. During the liquidation of the ghettos starting in 1942, the trains were used to transport the condemned populations to death camps. To implement the "Final Solution", the Nazis made their own Deutsche Reichsbahn an indispensable element of the mass extermination machine, wrote historian Raul Hilberg. Although the prisoner trains took away valuable track space, they allowed for the mass scale and shortened duration over which the extermination needed to take place. The fully enclosed nature of the locked and windowless cattle wagons greatly reduced the number and skill of troops required to transport the condemned Jews to their destinations. The use of railroads enabled the Nazis to lie about the "resettlement program" and, at the same time, build and operate more efficient gassing facilities which required limited supervision. The Nazis disguised their "Final Solution" as the mass "resettlement to the east". The victims were told they were being taken to labour camps in Ukraine. In reality, from 1942 on, for most Jews, deportations meant only death at either Bełżec, Chełmno, Sobibór, Majdanek, Treblinka, or Auschwitz-Birkenau. Some trains that had already transported goods to the Eastern front on their return carried human cargo bound for extermination camps. The plan was being realized in the utmost secrecy. In late 1942, during a telephone conversation, Hitler's private secretary Martin Bormann admonished Heinrich Himmler, who was informing him about 50,000 Jews already exterminated in a concentration camp in Poland. "They were not exterminated – Bormann screamed – only evacuated, evacuated, evacuated! ", and slammed down the phone, wrote Enghelberg. Following the Wannsee Conference of 1942, the Nazis began to murder the Jews in large numbers at newly built death camps of Operation Reinhard. Since 1941, the Einsatzgruppen, mobile extermination squads, were already conducting mass shootings of Jews in the Eastern territories which were occupied earlier by the Soviet Union, as well as east of the 1939 Soviet borders . The Jews of Western Europe were either deported to ghettos emptied through mass killings, such as the Rumbula massacre of the inhabitants of the Riga Ghetto, or sent directly to Treblinka, Belzec and Sobibór, extermination camps built in spring and summer of 1942 only for gassing. Auschwitz II Birkenau gas chambers began operating in March. The last death camp, Majdanek, began operating them in late 1942. At Wannsee, the SS estimated that the "Final Solution" could ultimately eradicate up to 11 million European Jews; Nazi planners envisioned the inclusion of Jews living in neutral and non-occupied countries such as Ireland, Sweden, Turkey, and the United Kingdom. Deportations on this scale required the coordination of numerous German government ministries and state organisations, including the Reich Main Security Office (RSHA), the Transport Ministry, and the Foreign Office. The RSHA coordinated and directed the deportations; the Transport Ministry organized train schedules; and the Foreign Office negotiated with German-allied states and their railways about "processing" their own Jews. In recent years, the German spokesman for the Train of Commemoration remembrance project, Hans-Rüdiger Minow, told The Jerusalem Post that from among the World War II railway staff and officials, there is "no word about those who committed the crimes" even though 200,000 train employees were involved in the rail deportations and "10,000 to 20,000 were responsible for mass murders". The railwaymen were never prosecuted. The first trains with German Jews expelled to ghettos in occupied Poland began departing from central Germany on 16 October 1941. Called Sonderzüge (special trains), the trains had low priority for the movement and would proceed to the mainline only after all other transports went through, inevitably extending transport time beyond expectations. 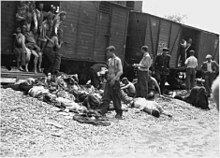 The trains consisted of sets of either third class passenger carriages, but mainly freight cars or cattle cars or both; the latter packed with up to 150 deportees, although 50 was the number proposed by the SS regulations. No food or water was supplied. The Güterwagen boxcars were fitted with only a bucket latrine. A small barred window provided irregular ventilation, which oftentimes resulted in multiple deaths from either suffocation or exposure to the elements. Some freight cars had a layer of quick lime on the floor. At times, the Germans did not have enough filled cars ready to start a major shipment of Jews to the camps, so the victims were kept locked inside overnight at layover yards. The Holocaust trains also waited for more important military trains to pass. An average transport took about four days. The longest transport of the war, from Corfu, took 18 days. When the train arrived at the camp and the doors were opened, everyone was already dead. Due to delays and cramped conditions, many deportees died in transit. On 18 August 1942, Waffen SS officer Kurt Gerstein had witnessed at Belzec the arrival of "45 wagons with 6,700 people, of whom 1,450 were already dead on arrival". That train came with the Jews of the Lwów Ghetto, less than 100 kilometres (62 mi) away. Jews from Carpatho-Ruthenia are "selected" on the Judenrampe, May–June 1944. To be sent to the right meant assignment to slave labour; to the left, the gas chambers. The SS built three extermination camps in occupied Poland specifically for Operation Reinhard: Bełżec, Sobibór, and Treblinka. They were fitted with identical mass killing installations disguised as communal shower rooms. In addition, gas chambers were developed in 1942 at the Majdanek concentration camp, and at Auschwitz II-Birkenau. In the German-occupied USSR, at the Maly Trostinets extermination camp, shootings were used to kill victims in the woods. At Chelmno, victims were killed in gas vans, whose redirected exhaust fed into sealed compartments at the rear of the vehicle. These were used at Trostinets as well. Neither of these two camps had international rail connections; therefore, the trains stopped at the nearby ghettos in Łódź and in Minsk, respectively. From there, the prisoners were taken by trucks. At Treblinka, Belzec, and Sobibor, the killing mechanism consisted of a large internal-combustion engine delivering exhaust fumes to gas chambers through pipes. At Auschwitz and Majdanek, the gas chambers relied on Zyklon B pellets of hydrogen cyanide, poured through vents in the roof from cans sealed hermetically. Once off the transports, the prisoners were split by category. The old, the young, the sick and the infirm were sometimes separated for immediate death by shooting, while the rest were prepared for the gas chambers. In a single 14-hour workday, 12,000 to 15,000 people would be killed at any one of these camps. The capacity of the crematoria at Birkenau was 20,000 bodies per day. The new arrivals who looked healthy were selected for slave labor in the Sonderkommandos, burying victims in mass graves and burning corpses under pain of death. Interior of a boxcar used to transport Jews and other Holocaust victims during World War II, the United States Holocaust Memorial Museum in Washington, D.C. The standard means of delivery was a 10 metre long freight car, although third class passenger carriages were also used when the SS wanted to keep up the "resettlement to work in the East" myth, particularly in the Netherlands and in Belgium. The SS manual covered such trains, suggesting a carrying capacity per each trainset of 2,500 people in 50 cars, each boxcar loaded with 50 prisoners. In reality, however, boxcars were routinely loaded to 200% of capacity, or 100 people per car. This resulted in an average of 5,000 people per trainset. Notably, during the mass deportation of Jews from the Warsaw Ghetto to Treblinka in 1942, trains carried up to 7,000 victims each. In total, over 1,600 trains were organised by the German Transport Ministry, and logged mainly by the Polish state railway company taken over by Germany, due to the majority of death camps being located in occupied Poland. Between 1941 and December 1944, the official date of the closing of the Auschwitz-Birkenau complex, the transport/arrival timetable was 1.5 trains per day: 50 freight cars × 50 prisoners per freight car × 1,066 days = ~4,000,000 prisoners in total. On 20 January 1943, Himmler sent a letter to Albert Ganzenmüller, the Under-secretary of State at the Reich Transport Ministry, requesting: "need your help and support. If I am to wind things up quickly, I must have more trains." Of the estimated 6 million Jews exterminated during World War II, 2 million were murdered on the spot by the military, political police, and mobile death squads of the Einsatzgruppen aided by the Orpo battalions and their auxiliaries. The remainder were shipped to their deaths elsewhere. Most of the Jews were forced to pay for their own deportations, particularly wherever passenger carriages were used. This payment came in the form of direct money deposit to the SS in light of the "resettlement to work in the East" myth. Charged in the ghettos for accommodation, adult Jews paid full price one-way tickets, while children under 10–12 years of age paid half price, and those under four went free. Jews who had run out of money were the first to be deported. The SS forwarded part of this money to the German Transport Authority to pay the German Railways for transport of the Jews. The Reichsbahn was paid the equivalent of a third class railway ticket for every prisoner transported to his or her destination: 8,000,000 passengers, 4 Pfennig per track kilometer, times 600 km (average voyage length), equaled 240 million Reichsmarks. German-made DRB Class 52 steam locomotive used by the Deutsche Reichsbahn during World War II. Members of this class were used in the Holocaust. Polish-made Pt31-64 steam locomotive produced by H. Cegielski – Poznań in the interwar Second Polish Republic. Members of this class were used by Nazi Germany for deportation actions. The Reichsbahn pocketed both this money and its own share of the cash paid by the transported Jews after the SS fees. According to an expert report established on behalf of the German "Train of Commemoration" project, the receipts taken in by the state-owned Deutsche Reichsbahn for mass deportations in the period between 1938 and 1945 reached a sum of US $664,525,820.34. Powered mainly by efficient steam locomotives, the Holocaust trains were kept to a maximum of 55 freight cars on average, loaded from 150% to 200% capacity. The participation of German State Railway (the Deutsche Reichsbahn) was crucial to the effective implementation of the "Final Solution of the Jewish Question". The DRB was paid to transport Jews and other victims of the Holocaust from thousands of towns and cities throughout Europe to meet their death in the Nazi concentration camp system. As well as transporting German Jews, DRB was responsible for coordinating transports on the rail networks of occupied territories and Germany's allies. The characteristics of organized concentration and transportation of victims of the Holocaust varied by country. After Germany invaded Belgium on 10 May 1940, all Jews were forced to register with the police as of 28 October 1940. The lists enabled Belgium to become the first country in occupied Western Europe to deport recently immigrating Jews. The implementation of the "Final Solution" in Belgium centred on the Mechelen transit camp (Malines) chosen because it was the hub of the Belgian National Railway system. The first convoy left Mechelen transit camp for extermination camps on 22 July 1942, although nearly 2,250 Jews had already been deported as forced laborers for Organisation Todt to Northern France. By October 1942, some 16,600 people had been deported in 17 convoys. At this time, deportations were temporarily halted until January 1943. Those deported in the first wave were not Belgian citizens, resulting from the intervention by Queen Elisabeth with the German authorities. In 1943, the deportations of Belgians resumed. A cattle truck used for the transport of Belgian Jews to camps in Eastern Europe. The openings were covered in barbed wire. This example is preserved at Fort Breendonk. In September, Jews with Belgian citizenship were deported for the first time. After the war, the collaborator Felix Lauterborn stated in his trial that 80 percent of arrests in Antwerp used information from paid informants. In total, 6,000 Jews were deported in 1943, with another 2,700 in 1944. Transports were halted by the deteriorating situation in occupied Belgium before the liberation. The percentages of Jews which were deported varied by location. It was highest in Antwerp, with 67 percent deported, but lower in Brussels (37 percent), Liége (35 percent) and Charleroi (42 percent). The main destination for the convoys was Auschwitz concentration camp in occupied Poland. Smaller numbers were sent to Buchenwald and Ravensbrück concentration camps, as well as Vittel concentration camp in France. In total, 25,437 Jews were deported from Belgium. Only 1,207 of these survived the war. The only time during World War II that a Holocaust train carrying Jewish deportees from Western Europe was stopped by the Underground happened on 19 April 1943, when the Transport No. 20 left Mechelen with 1,631 Jews, heading for Auschwitz. Soon after leaving Mechelen, the driver stopped the train after seeing an emergency red light, set by the Belgians. After a brief fire fight between the Nazi train guards and the three resistance members – equipped only with one pistol between them – the train started again. Of the 233 people who attempted to escape, 26 were shot on the spot, 89 were recaptured, and 118 got away. Bulgaria joined the Axis powers in March 1941 and took part in the invasion of Yugoslavia and Greece. The Bulgarian government set up transit camps in Skopje, Blagoevgrad and Dupnitsa for the Jews from the former Serbian province of Vardar Banovina and Thrace (today's Republic of Macedonia and Greece). The "deportations to the east" of 13,000 inmates, mostly to Treblinka extermination camp began on 22 February 1943, predominantly in passenger cars. In four days, some 20 trainsets departed under severely overcrowded conditions to occupied Poland requiring each train to stop daily to dump the bodies of Jews who died during the previous 24 hours. In May 1943 the Bulgarian government led by King Boris III expelled 20,000 Jews from Sofia and at the same time, made plans to deport Bulgaria's Jews to the camps pursuant to an agreement with Germany. A Holocaust train from Thrace was witnessed by Archbishop Stefan of Sofia who was shocked by what he saw. His protest letter along with those of other Orthodox clergymen were ignored by the King. A demonstration in Sofia on 24 May 1943 by the Jewish community led by Rabbi Daniel Zion was quashed by Bulgarian police arresting 400 Jews. Luckily, a small delegation under parliamentarian Dimitar Peshev managed to launch a successful protest at the Ministry of Internal Affairs. The new order issued by Minister Petar Gabrovski to release the Jews already rounded up, was not reversed. His decision prevented the Jewish community of 49,000 people from being exterminated in death camps of the General Government. Nevertheless, the Bulgarian Jews remained the subject of severe racial restrictions locally, and were stripped by the government of currency, jewelry, and gold handed over to the Bulgarian national bank. According to Bulgarian historian Nissan Oren, King Boris did not show any humanitarian inclinations for the Jews of his country, and the later claims of his benevolence are without firm foundation. Czechoslovakia was annexed by Nazi Germany in 1939. Within the new ethnic-Czech Protectorate of Bohemia and Moravia the Czechoslovak State Railways (ČSD) were taken over by the Reichsbann and the new German railway company Böhmisch-Mährische Bahn (BMB) was set up in its place. The Czech human losses in World War II were considerably lower than among other nations, estimated at between 36,000 and 55,000 with a positive growth ratio due to rising birthrate, except for the Jews. One entire town was turned into a walled-off ghetto in 1941, and named Theresienstadt. In all, it contained around 50,000 Jews from the Protectorate, and 37,000 from the Reich, with the remaining 20,000 Jews transported to other camps. Three-quarters of Bohemian and Moravian Jews died in the Holocaust, of whom 33,000 died in Terezín. The remainder were transported in Holocaust trains from Theresienstadt mainly to Auschwitz-Birkenau. The last train for Birkenau left Theresienstadt on 28 October 1944 with 2,038 Jews of whom 1,589 were immediately gassed. The French national SNCF railway company under the Vichy Government played its part in the "Final Solution". In total, the Vichy government deported more than 76,000 Jews, without food or water (pleaded for by the Red Cross in vain), as well as thousands of other so-called undesirables to German-built concentration and extermination camps aboard the Holocaust trains, pursuant to an agreement with the German government; fewer than 3 percent survived the deportations. According to Serge Klarsfeld, president of the organization Sons and Daughters of Jewish Deportees from France, SNCF was forced by German and Vichy authorities to cooperate in providing transport for French Jews to the border and did not make any profit from this transport. However, in December 2014, SNCF agreed to pay up to $60 million worth of compensation to Holocaust survivors in the United States. It corresponds to approximately $100,000 per survivor. Drancy internment camp served as the main transport hub for the Paris area and regions west and south thereof until August 1944, under the command of Alois Brunner from Austria. By 3 February 1944, 67 trains had left from there for Birkenau. Vittel internment camp served the northeast, closer to the German border from where all transports were taken over by German agents. By 23 June 1943, 50,000 Jews had been deported from France, a pace that the Germans deemed too slow. The last train from France left Drancy on 31 July 1944 with over 300 children. July 1942 selection of Jews in Thessaloniki. After the invasion, Greece was divided between the Italian, Bulgarian, and the German zones of occupation until September 1943. Most Greek Jews lived in Thessaloniki (Salonika) ruled by Germany, where the collection camp was set up for the Jews also from Athens and the Greek Islands. From there 45,000–50,000 Jews were sent to Auschwitz-Birkenau between March and August 1943, packed 80 to a wagon. There were also 13,000 Greek Jews in the Italian, and 4,000 Jews in the Bulgarian zone of occupation. In September 1943, the Italian zone was taken over by the Third Reich. Overall, some 60,000–65,000 Greek Jews were deported in Holocaust trains by the SS to Auschwitz, Majdanek, Dachau and the subcamps of Mauthausen before the war's end, including over 90% of Thessaloniki's prewar population of 50,000 Jews. Of these, 5,000 Jews were deported to Treblinka from the regions of Thrace and from Macedonia in the Bulgarian share of the partitioned Greece, where they were gassed upon arrival. Under Hungarian control the number of Jews grew to a total of 725,007 officially by 1941. Some 184,453 of them lived in Budapest. While in alliance with Nazi Germany, Hungary acquired new provinces at both the First and the Second Vienna Awards (1938; 1940). The Hungarian Army received vital help from the Hungarian State Railways (MÁV) in Northern Transylvania (Erdély). The non-native Jews were expelled from the Hungarian territory; some 20,000 of them were transported to occupied Czechoslovakia and Yugoslavia, while the Transylvanian Jews were sent back to Romania. Hungary took part in Operation Barbarossa, supplying 50,000 Jewish slave labour for the Eastern Front. Most of the workers were dead by January 1943. Later that year, Hitler discovered that Prime Minister Miklos Kállay secretly conferred with the Western Allies. To stop him, Germany launched the Operation Margarethe in March 1944, and took over control of all Jewish affairs. On 29 April 1944, the first deportation of Hungarian Jews to Birkenau took place. Between 15–25 May according to SS-Brigadeführer Edmund Veesenmayer 138,870 Jews had been deported. On 31 May 1944, Veesenmayer reported additional 60,000 Jews sent to the camps in six days, while the total for the past 16 days stood at 204,312 victims. Between May and July 1944, helped by Hungarian police, the German Sicherheitspolizei deported nearly 440,000 Hungarian Jews mostly to Auschwitz-Birkenau, or 437,000 at the rate of 6,250 per day. Approximately 320,000 Hungarian Jews are estimated to have been murdered at Auschwitz-Birkenau before July 1944. On 8 July, the deportation of Jews from Hungary had stopped due to international pressure by the Pope, the King of Sweden, and the Red Cross (all of whom had recently learned about the extent of it). However, in October 1944 some 50,000 Jews were forced on a death march to Germany following a coup d'état which put the Hungarian pro-Nazi government back in control. They were forced to dig anti-tank ditches on the road westward. A further 25,000 Jews were put in an "international ghetto" under Swedish protection engineered by Carl Lutz and Raoul Wallenberg. When the Soviet Army liberated Budapest on 17 January 1945, of the original 825,000 Jews in the country, less than 260,000 Jews were still alive, including 80,000 Hungarian natives. The popular view that Benito Mussolini resisted the deportation of Italian Jews to Germany is widely seen as simplistic by Jewish scholars, because the Italian Jewish community of 47,000 constituted the most assimilated Jews in Europe. About one out of every three Jewish males were members of the Fascist Party before the war began; more than 10,000 Jews who used to conceal their identity, because antisemitism was part of the very ideal of italianità wrote Wiley Feinstein. The Holocaust came to Italy in September 1943 after the German takeover of the country due to its total capitulation at Cassibile. By February 1944, the Germans shipped 8,000 Jews to Auschwitz-Birkenau via Austria and Switzerland, although more than half of the victims arrested and deported from northern Italy were rounded up by the Italian police and not by the Nazis. Also between September 1943 and April 1944, at least 23,000 Italian soldiers were deported to work as slaves in German war industry, while over 10,000 partisans were captured and deported during the same period to Birkenau. By 1944, there were over half a million Italians working inside the Nazi war machine. The Netherlands was invaded on 10 May 1940 and fell under the German military control. The community of native-Dutch Jews including the new Jewish refugees from Germany and Austria was estimated at 140,000. Most natives were concentrated in the Amsterdam ghetto before being moved to Westerbork transit camp in the north-east near the German border. Deportees for "resettlement" leaving aboard the NS passenger and freight trains were unaware of their final destination or fate, as postcards were often thrown from moving trains. Most of the approximately 100,000 Jews sent to Westerbork perished. Between July 1942 and September 1944 almost every Tuesday a train left for Auschwitz-Birkenau and Sobibor extermination camps, or Bergen-Belsen and Theresienstadt, in a total of 94 outgoing trains. About 60,000 prisoners were sent to Auschwitz and 34,000 to Sobibor. At liberation approximately 870 Jews remained in Westerbork. Only 5,200 deportees survived, most of them in Theresienstadt, approximately 1980 survivors, or Bergen-Belsen, approximately 2050 survivors. From those on the sixty-eight transports to Auschwitz 1052 people returned, including 181 of the 3450 people taken from eighteen of the trains at Cosel. There were 18 survivors out of approximately one thousand people selected from the nineteen trains to Sobibor, the remainder were murdered on arrival. For the Netherlands, the overall survival rate among Jews who boarded the trains for all camps was 4.86 percent. On 29 September 2005, the Dutch national rail company Nederlandse Spoorwegen (NS) apologised for its role in the deportation of Jews to the death camps. Action Saybusch, 24 September 1940. Expelled Poles await transport at a railway crossing (in this photo, some members of the 129 families deported from Dolna Sól). Following invasion of Poland in September 1939 Nazi Germany disbanded Polish National Railways (PKP) immediately, and handed over their assets to the Deutsche Reichsbahn in Silesia, Greater Poland and in Pomerania. In November 1939, as soon as the semi-colonial General Government was set up in occupied central Poland, a separate branch of DRB called Generaldirektion der Ostbahn (Kolej Wschodnia in Polish) was established with headquarters called GEDOB in Kraków; all of the DRB branches existed outside Germany proper. The Ostbahn was granted 3,818 kilometres (2,372 mi) of railway lines (nearly doubled by 1941) and 505 km of narrow gauge, initially. In December 1939, on the request of Hans Frank in Berlin, the Ostbahndirektion was given financial independence after paying back 10 million Reichsmarks to DRB. The removal of all bomb damage was completed in 1940. The Polish management was either executed in mass shooting actions (see: the 1939 Intelligenzaktion and the 1940 German AB-Aktion in Poland) or imprisoned at the Nazi concentration camps. Managerial jobs were staffed with German officials in a wave of some 8,000 instant promotions. The new Eastern Division of DRB acquired 7,192 kilometres (4,469 mi) of new railway lines and 1,052 km of (mostly industrial) narrow gauge in the annexed areas. The first Polish agglomeration subjected to forcible expulsion of Polish nationals was the port city of Gdynia. In total, 70,000-80,000 civilians had been expelled. The forced displacement of 18,000–20,000 Poles from Silesia began during Action Saybusch of 1939 and ballooned to around 265,000 before 1944, on top of 630,000 expelees from the Wartheland. The total number of Polish nationals deported from Polish areas annexed by Nazi Germany reached 923,000. The DRB trains were used to cleanse and resettle interwar Poland with the German-speaking colonists in the name of "Lebensraum". Expulsion of civilians from Poland's capital after the Warsaw Uprising, through Dulag in Pruszków. Female prisoners attended by Red Cross. Prisoners were sent to concentration camps including Auschwitz. The German SS employed Ostbahn to conduct the first mass transport to Auschwitz concentration camp (which just opened) in mid June 1940. Notably, the Birkenau infamous "Gate of Death" for the incoming freight trains at Auschwitz was built in 1943 long after its gas chambers went into operation. Expulsions were part of a broader Nazi policy called Generalplan Ost. The plan resulted in forced removal of over 1.7 million ethnic Poles from their homes. Poles were deported to any one of the German forced labour camps including over 30 Polenlager camps in Germany and in German-occupied territory. Mass deportations of Polish nationals using freight trains (but also lorries) took place during the ethnic cleansing of Zamojszczyzna between November 1942 and July 1943, in which all branches of German police including Orpo and Sonderdienst, as well as Wehrmacht and the Ukrainian Auxiliary Police participated. Over 110,000 Poles were forcibly removed from liquidated villages in the General Government, including around 30,000 children most of whom were never found. In the second phase of the same plan which was dubbed the Ukraineraktion, the Germans brought in trainloads of Ukrainian peasants into the area of Zamość, in order to form a buffer zone shielding the 10,000 ethic German colonists arriving Heim ins Reich from Romania among other places. By the end of March 1943, over 7,000 Ukrainian peasants were placed in the areas surrounding the settlers, and 116 villages around Zamość had been cleansed of their Polish inhabitants. The Deutsche Reichsbahn acquired new infrastructure in Poland worth in excess of 8,278,600,000 złoty, including some of the largest locomotive factories in Europe, the H. Cegielski – Poznań renamed DWM, and Fablok in Chrzanów renamed Oberschlesische Lokomotivwerke Krenau producing engines Ty37 and Pt31 (designed in Poland), as well as the locomotive parts factory Babcock-Zieleniewski in Sosnowiec renamed Ferrum AG (tasked with making parts to V-1 i V-2 rockets also). Under the new management, formerly Polish companies began producing German engines BR44, BR50 and BR86 as early as 1940 virtually for free, using forced labor. All Polish railwaymen were ordered to return to their place of work, or face death. Beating with fists became commonplace, although perceived as shocking by Polish long-term professionals. Their public executions were introduced in 1942. By 1944, the factories in Poznań and Chrzanów were mass-producing the redesigned "Kriegslok" BR52 locomotives for the Eastern front, all stripped of coloured metals by the rule with intentionally shortened lifespan. Before the onset of Operation Reinhard which marked the most deadly phase of the Holocaust in Poland many Jews were transported by road to killing sites such as the Chełmno extermination camp, equipped with gas vans. In 1942, stationary gas chambers were built at Treblinka, Belzec, Sobibor, Majdanek and Auschwitz. After the Nazi takeover of PKP, the train movements, originating inside and outside occupied Poland and terminating at death camps, were tracked by Dehomag using IBM-supplied card-reading machines and traditional waybills produced by the Reichsbahn. The Holocaust trains were always managed and directed by native German SS men posted with that express' role throughout the system. The Höfle Telegram lists the number of arrivals to the Reinhard camps through 1942 as 1,274,166 Jews based on Reichsbahn own records. The last train to be sent to Treblinka extermination camp left Białystok Ghetto on 18 August 1943; all prisoners were killed in gas chambers after which the camp closed down per Globocnik's directive. Of the more than 245,000 Jews who passed through the Łódź Ghetto, the last 68,000 inmates, by then the largest final gathering of Jews in all of German occupied Europe, had been liquidated by the Nazis after 7 August 1944. They were told to prepare for resettlement; instead, over the next 23 days they were sent to Birkenau by train at the rate of 2,500 per day, with some of the crippled selected by Josef Mengele for his "medical experiments". The rail traffic on most Polish railway lines was extremely dense. In 1941, an average of 420 German trains were passing through every 24 hours on top of Polish internal traffic; in 1944 the number rose to 506 military transports per day. No new lines had been built by Nazi Germany. Most supplies from layover yards were taken away. However, almost all Polish language signs were replaced with German, which led to new problems. On 24 November 1944, two trains (one German with military cargo, and one Polish) traveling at regular speeds collided head-on in Barwałd Średni near Wadowice. It was the biggest train collision of World War II in occupied Poland with both locomotives and nearly half of their trainsets destroyed completely. Some 130 people from the Polish passenger train were killed and over 100 wounded. Pulling dead Jews from the Holocaust train in Romania traveling for 7 days in total, July 1941. Căile Ferate Române (Romanian Railways) were involved in the transport of Jewish and Romani people to concentration camps in Romanian Old Kingdom, Bessarabia, northern Bukovina, and Transnistria. In a notable example, after the Iasi pogrom events, Jews were forcibly loaded onto freight cars with planks hammered in place over the windows and traveled for seven (7) days in unimaginable conditions. Many died and were gravely affected by lack of air, blistering heat, lack of water, food or medical attention. These veritable death trains arrived to their destinations Podu Iloaiei and Călăraşi with only one-fifth of their passengers alive. No official apology was released yet by Căile Ferate Române for their role in the Holocaust in Romania. Norway surrendered to Nazi Germany on 10 June 1940. At the time, there were 1,700 Jews living in Norway. About half of them escaped to neutral Sweden. Round ups by the SS began in the fall of 1942 with support of the Norwegian police. In late November 1942, all Jews of Oslo including women and children were put on a ship requisitioned by the Quisling government and taken to Hamburg, Germany. From there, they were deported to Auschwitz-Birkenau by train. In total, 770 Norwegian Jews were sent by boat to Nazi Germany between 1940 and 1945. Only two dozen survived. On 9 September 1941, the parliament of the Slovak Republic – a Nazi puppet state – ratified the Jewish Codex, a series of laws and regulations that stripped Slovakia's 80,000 Jews of their civil rights and all means of economic survival. The fascist Slovak leadership was so impatient to get rid of Jews that it paid the Nazis DM 500 in exchange for each expelled Jew and a promise that the deportees would never return to Slovakia. The decision by Slovakia to initiate and pay for the expulsion was unprecedented among the satellite states of Nazi Germany. They paid 40 millions RM to the SS for it. Some 83 percent of the Jewish population perished in two waves of deportations to Auschwitz, Belzec, and Majdanek; the second wave after the Uprising of 28–29 August 1944. Switzerland was not invaded because its mountain bridges and tunnels between Germany and Italy were too vital for them to go into war. Also, the Swiss banks provided necessary access to international markets by dealing in pilfered gold. There were 18,000 Jews living in Switzerland at the onset of World War II. The country did not turn over their own Jews to the Germans, but according to three anonymous eyewitnesses, allowed the Holocaust trains (aware of them since 1942) to use the Gotthard Tunnel on the way to the camps. Most war supplies to Italy were shipped through the Austrian Brenner Pass. There exists substantial evidence that these shipments included Italian forced labour workers and trainloads of Jews in 1944 during the Nazi occupation of northern Italy, when a German train passed through Switzerland every 10 minutes. The need for the tunnel was complicated by the British Royal Air Force having bombed and disrupted services through the Brenner Pass, as well as a heavy snowfall in the winter of 1944–45. Of 43 trains that could be tracked down by the 1996 Bergier Commission, 39 went via Austria (Brenner, Tarvisio), one via France (Ventimiglia-Nice). The commission could not find any evidence that the other three passed through Switzerland. It is possible that the train could have been carrying dissidents back from concentration camps. Started in 1944, some repatriation trains went through Switzerland officially, organised by the Red Cross. After the Soviet Army began making severe inroads into German-occupied Europe and the Allies landed in Normandy in June 1944, the number of trains and transported persons began to vary greatly. By November 1944, with the closure of Birkenau and the advance of the Soviet Army, the death trains had ceased. Conversely, the subsequent death marches had the advantage of being able to utilize the forced labour to build defences. As the Soviet and Allied Armies made their final pushes, the Nazis transported some of the concentration camp survivors either to other camps located inside the collapsing Third Reich, or to the border areas where they believed they could negotiate the release of captured Nazi Prisoners of War in return for the "Exchange Jews" or those that were born outside the Nazi occupied territories. Many of the inmates were transported via the infamous death marches, but among other transports three trains left Bergen-Belsen in April 1945 bound for Theresienstadt—all were liberated. The last recorded train is the one used to transport the women of the Flossenbürg March, where for three days in March 1945 the remaining survivors were crammed into cattle cars to await further transport. Only 200 of the original 1000 women survived the entire trip to Bergen-Belsen. The wagon monument, Yad Vashem, Jerusalem. There are numerous national commemorations of the mass transportation of Jews in the "Final Solution" across Europe, as well as some lingering controversies surrounding the history of the railway systems utilized by the Nazis. All railway lines leading to death camps built in occupied Poland are ceremonially cut off from the existing railway system in the country, similar to the well-preserved arrival point at Auschwitz known as the "Judenrampe" platform. The commemorative monuments are traditionally erected at collection points elsewhere. In 1988, a national monument was created at the Umschlagplatz of the Warsaw Ghetto. Designed by architect Hanna Szmalenberg and sculptor Władysław Klamerus, it consists of a stone structure symbolizing an open freight car. In Kraków, the memorial to Jews from the Kraków Ghetto deported during the Holocaust spreads over the entire deportation site known as the Square of the Ghetto Heroes (Plac Bohaterow Getta). Inaugurated in December 2005, it consists of oversized steel chairs (each representing 1,000 victims), designed by architects Piotr Lewicki and Kazimierz Latak. At the former Łódź Ghetto, the monument was built at the Radegast train station (Bahnhof Radegast), where approximately 200,000 Polish, Austrian, German, Luxemburg and Czech Jews boarded the trains on the way to their deaths in the period from 16 January 1942, to 29 August 1944. In 2004/2005, German historians and journalists began publicly demanding that at the German passenger train stations commemorative exhibits be set up, after the railroad companies in France and the Netherlands began commemorations of Nazi mass deportations in their own train stations. The Deutsche Bahn AG (DB AG), the state-owned successor of the Deutsche Reichsbahn replied: "we do not have either the personnel or the financial resources" for that kind of commemoration. Demonstrations then began at railway stations in Frankfurt am Main and in Cologne as well as inside the long-distance border-crossing trains. Because the DB AG had responded by having its security personnel repress the protests, German citizens' initiatives rented a historical steam locomotive and installed their own exhibition in remodeled passenger cars. This "Train of Commemoration" made its first journey on the 2007 International Holocaust Remembrance Day of January 27. The Deutsche Bahn AG refused it access to the main stations in Hamburg and Berlin. German Jewish communities protested against the company levying mileage tariffs and hourly fees for the exhibit (which by December 31, 2013 reached approx. US $290,000). Parliamentarians of all parties in the German national parliament called on the DB AG to rethink its behavior. Federal Transport Minister Wolfgang Tiefensee proposed an exhibition by artist Jan Philipp Reemtsma on the railways' role in the deportation of 11,000 Jewish children to their deaths in Nazi concentration and extermination camps throughout World War II. Because the CEO of the railroad company maintained his refusal, a "serious rift" occurred between himself and the Minister of Transport. On January 23, 2008, a compromise was reached, wherein the DB AG established its own stationary exhibit Sonderzüge in den Tod [Chartered Trains to Death – Deportation with the German Reichsbahn]. As national press journals pointed out, the exhibit "contained nearly nothing about the culprits". The post-war careers of those in charge of the railroad remained "totally obscured". Since 2009 the civil society association Train of Commemoration which, with its donations financed the exhibition "Train of Commemoration" presented at 130 German stations with 445,000 visitors, has been demanding cumulative compensation for the survivors of these deportations by train. The railroad's proprietors (the German Minister of Transport and the German Minister of Finances) reject this demand. In 1992, SNCF commissioned a report on its involvement in World War II. The company opened its archives to an independent historian, Christian Bachelier, whose report was released in French in 2000. It was translated to English in 2010. In 2001, a lawsuit was filed against French government-owned rail company SNCF by Georges Lipietz, a Holocaust survivor, who was transported by SNCF to the Drancy internment camp in 1944. Lipietz was held at the internment camp for several months before the camp was liberated. After Lipietz's death the lawsuit was pursued by his family and in 2006 an administrative court in Toulouse ruled in favor of the Lipietz family. SNCF was ordered to pay 61,000 Euros in restitution. SNCF appealed the ruling at an administrative appeals court in Bordeaux, where in March 2007 the original ruling was overturned. According to historian Michael Marrus, the court in Bordeaux "declared the railway company had acted under the authority of the Vichy government and the German occupation" and as such could not be held independently liable. [note 3] Marrus wrote in his 2011 essay that the company has nevertheless taken responsibility for their actions and it is the company's willingness to open up their archives revealing involvement in the transportation of Holocaust victims that has led to the recent legal and legislative attention. Between 2002 and 2004 the SNCF helped fund an exhibit on deportation of Jewish children that was organized by Nazi hunter Serge Klarsfeld. In 2011, SNCF helped set up a railway station outside of Paris to a Shoah Foundation for the creation of a memorial to honor Holocaust victims. In December 2014, the company came to a $60 million compensation settlement with French Holocaust survivors living in the United States. Nederlandse Spoorwegen used its 29 September 2005 apology for its role in the "Final Solution" to launch an equal opportunities and anti-Discrimination policy, in part to be monitored by the Dutch council of Jews. ^ Although Kastner was later criticised for putting his own family on the train, Hansi Brand, a member of the Vaada testified at Eichmann's trial in Jerusalem in 1961 that Kastner had included his family to reassure the others that the train was safe, and was not destined, as they feared, for Auschwitz. ^ To date, of the 1,176 paintings on the Gold Train originally stored by the U.S. Army, only one has been repatriated. On 30 September 2005, the U.S. Government reached agreement with the representatives of the Hungarian Jewish community to pay $25.5 million in compensation with additional $500,000 for the creation of archives preserving documents associated with the Gold Train, and to declassify any remaining documents related to it. ^ Following the Lipietz trial, SNCF's involvement in World War II became the subject of attention in the United States when SNCF explored bids on rail projects in Florida and California, and SNCF's partly owned subsidiary, Keolis Rail Services America bid on projects in Virginia and Maryland. In 2010, Keolis placed a bid on a contract to operate the Brunswick and Camden lines of the MARC train in Maryland. Following pressure from Holocaust survivors in Maryland, the state passed legislation in 2011 requiring companies bidding on the project to disclose their involvement in the Holocaust. Keolis currently operates the Virginia Railway Express, a contract the company received in 2010. In California, also in 2010, state lawmakers passed the Holocaust Survivor Responsibility Act. The bill, written to require companies to disclose their involvement in World War II, was later vetoed by Governor Arnold Schwarzenegger. While bidding on these rail contracts, SNCF was criticized for not formally acknowledging and apologizing for its involvement in World War II. In 2011, SNCF chairman Guillaume Pepy released a formal statement of regrets for the company's actions during World War II. Some historians have expressed the opinion that SNCF has been unfairly targeted in the United States for their involvement in World War II. Human rights attorney Arno Klarsfeld has argued that the negative focus on SNCF was disrespectful to the French railway workers who lost their lives engaging in acts of resistance. ^ a b c d e Hedi Enghelberg (2013). The trains of the Holocaust. Kindle Edition. p. 63. ISBN 978-160585-123-5. Book excerpts from Enghelberg.com. ^ a b Prof. Ronald J. Berger, University of Wisconsin–Whitewater (2002). Fathoming the Holocaust: A Social Problems Approach. Transaction Publishers. pp. 57–58. ISBN 978-0202366111. Bureaucrats in the Reichsbahn performed important functions that facilitated the movement of trains. They constructed and published timetables, collected fares, and allocated cars and locomotives. In sending Jews to their death, they did not deviate much from the routine procedures they used to process ordinary train traffic. ^ a b c Ben Hecht, Julian Messner (December 31, 1969), Holocaust: The Trains. Archived February 22, 2014, at the Wayback Machine Aish.com Holocaust Studies. ^ HOLOCAUST FAQ: Operation Reinhard: A Layman's Guide (2/2). ^ Tomasz Wiścicki (16 April 2013), Train station to hell. Treblinka death camp retold by Franciszek Ząbecki [Stacja tuż obok piekła. Treblinka w relacji Franciszka Ząbeckiego], Muzeum Historii Polski [Museum of Polish History], archived from the original on October 6, 2013, retrieved 2 February 2016 – via Internet Archive, Wspomnienia dawne i nowe by Franciszek Ząbecki (en), Pax publishig, Warsaw 1977. ; also in Clancy Young (2013), Treblinka Death Camp Day-by-Day. Tables with record of daily deportations, Holocaust Education & Archive Research Team, archived from the original on May 22, 2013, retrieved 2 February 2016 – via Internet Archive, Timeline of Treblinka (en). ^ a b Raul Hilberg (1998). "German Railroads / Jewish Souls". The Role of the German Railroads in the Destruction of the Jews. 35 (2): 162–174. doi:10.1007/BF02838139. ^ "1939: The War Against The Jews." The Holocaust Chronicle published by Publications International, April 2000. ^ Michael Berenbaum, The World Must Know, United States Holocaust Memorial Museum, 2006, p. 114. ^ a b Peter Vogelsang & Brian B. M. Larsen, "The Ghettos of Poland." Archived 2013-10-22 at the Wayback Machine The Danish Center for Holocaust and Genocide Studies. 2002. ^ Marek Edelman. "The Ghetto Fights". The Warsaw Ghetto: The 45th Anniversary of the Uprising. Literature of the Holocaust, at the University of Pennsylvania. ^ François Furet, Unanswered Questions: Nazi Germany and the Genocide of the Jews. Schocken Books (1989), p. 182; ISBN 0-8052-4051-9. ^ Holocaust Encyclopedia. "'Final Solution': Overview". United States Holocaust Memorial Museum. Archived from the original on 2 March 2013. ^ "Deportation and transportation". The Holocaust Explained. London Jewish Cultural Centre. 2011. Retrieved 6 February 2014. ^ The Holocaust Chronicle. "Reichsbahn". Death and Resistance. Publications International. p. 415. Retrieved 6 February 2014. ^ Rossino, Alexander B. (2003). "Polish 'Neighbors' and German Invaders: Contextualizing Anti-Jewish Violence in the Białystok District during the Opening Weeks of Operation Barbarossa". Polin. 16. Note 97. Archived from the original on February 22, 2014. Cited in German court hearing: Vernehmung von Oberregierungsrat Graf von dem G., 2 September 1960. ZStL, 5 AR-Z 13/62, p. 11. ^ Jewish Virtual Library (2009). "Gas Chambers at Majdanek". Majdanek, Auschwitz II, Sobibor, Belzec and Treblinka. The American-Israeli Cooperative. Retrieved 11 February 2014. ^ German Railways and the Holocaust at the United States Holocaust Memorial Museum. ^ Benjamin Weinthal, Berlin (2008-04-17). "Mobile Holocaust exhibit forced to skip stop to ensure German railway system run on time". No Berlin stop for Shoah train. The Jerusalem Post. Retrieved 5 February 2014. ^ a b "The Holocaust". Concentration Camps & Death Camps. Raiha Evelyn. Archived from the original on July 23, 2009. Retrieved 4 February 2014. ^ a b c Richard L. Rubenstein; John K. Roth (2003). Approaches to Auschwitz. Westminster John Knox Press. p. 362. ISBN 9780664223533 – via Google Books, search inside. ^ a b Joshua Brandt (April 22, 2005). "Holocaust survivor gives teens the straight story". Jewish news weekly of Northern California. Archived from the original on November 26, 2005. Retrieved 5 February 2014. ^ a b Kurt Gerstein, "Gerstein Report" in English translation. Tübingen, 4 May 1945. ^ Holocaust Encyclopedia, "Belzec: Chronology" United States Holocaust Memorial Museum, 2013. ^ "The Auschwitz Album". Yad Vashem. Retrieved 4 February 2014. ^ a b c Yad Vashem (2013). "Aktion Reinhard" (PDF). Shoah Resource Center, The International School for Holocaust Studies. Retrieved 6 April 2014 – via direct download 33.1 KB. ^ Grossman, Vasily (1946). "The Treblinka Hell" (PDF). Moscow: Foreign Languages Publishing House. (online). Retrieved 6 April 2014 – via direct download 2.14 MB. ^ Yad Vashem (2013). "Maly Trostinets" (PDF). Shoah Resource Center, The International School for Holocaust Studies. Retrieved 1 September 2013 – via direct download, 19.5 KB. ^ "The genocide: 1942 (Chelmno, Maly Trostinets)". Peace Pledge Union. Retrieved 6 April 2014. ^ a b "Maly Trostinec". ARC 2005. Retrieved 6 April 2014. Maly Trostinec most closely resembled Chelmno, although at Maly Trostinec, murder was principally committed by shooting. ^ Chris Webb; Carmelo Liscioto. "Maly Trostinets. The Death Camp near Minsk". Holocaust Research Project.org 2008. Retrieved 6 April 2014. Jews were killed by means of mobile gas chambers... and shot to death in front of pits, 50 meters long and 3 metres deep. ^ a b c Arad, Yitzhak (1987). Belzec, Sobibor, Treblinka. The Operation Reinhard Death Camps. Bloomington, Indianapolis: Indiana University Press. p. 31. ISBN 978-0-253-21305-1 – via Google Books, preview. Testimony of SS Scharführer Erich Fuchs in the Sobibor-Bolender trial, Düsseldorf. ^ a b Piper, Franciszek (1994). "Gas Chambers and Crematoria". In Gutman, Yisrael; Berenbaum, Michael (eds.). Anatomy of the Auschwitz Death Camp. Bloomington, Indiana: Indiana University Press. pp. 169–170. ISBN 978-0-253-32684-3. ^ Alex Woolf (2008). A Short History of the World. ISBN 9781848588721. ^ McVay, Kenneth (1984). "The Construction of the Treblinka Extermination Camp". Yad Vashem Studies, XVI. Jewish Virtual Library.org. Retrieved 3 November 2013. ^ Friedlander, Saul (2009). The Years of Extermination. New York: HarperCollins. ISBN 978-0-06-198000-8. ^ Geoffrey P. Megargee (2009). The United States Holocaust Memorial Museum Encyclopedia of Camps and Ghettos, 1933-1945. Indiana University Press. p. 1514. ISBN 978-0253003508. Retrieved 4 February 2014. ^ "Treblinka: Railway Transports". This Month in Holocaust History. Yad Vashem. Archived from the original on 8 October 2014. Retrieved 4 February 2014. ^ a b NAAF Project. "The Holocaust timeline: 1943". NeverAgain.org, Internet Archive. Archived from the original on August 22, 2006. Retrieved 5 February 2014. ^ Claude Lanzmann Shoah Collection (July 1978). Henryk Gawkowski and Treblinka railway workers (Camera Rolls #4-7) (in Polish and French). USHMM, Washington, DC: Steven Spielberg Film and Video Archive. Event occurs at 02:10:59 and 07:10:16. ID: 3362-3372. Retrieved 8 September 2015 – via Clips viewable online. ^ a b Ireneusz Bujniewicz (2009). "Możliwości finansowe PKP w przebudowie i rozbudowie kolejnictwa" (PDF). Kolejnictwo w przygotowaniach obronnych Polski w latach 1935–1939. Wydawnictwo Tetragon Publishing. p. 22. Retrieved 8 February 2014 – via PDF file, direct download 363 KB. ^ Train of Commemoration (November 2009). Expert Report on the Deutsche Reichsbahn's Receipts (PDF). Obtained during the Nazi Dictatorship for Services in Transporting Persons from the German Reich and Occupied Areas of Europe to Concentration Camps (in German, English, French, and Polish). Train of Commemoration Registered, Non-Profit Association, Berlin. Archived from the original (PDF) on 2014-02-22. Retrieved 4 February 2014 – via direct download 740 KB from Wayback Machine. With payment summaries, tables and literature. ^ a b "The Destruction of the Jews of Belgium". Holocaust Education & Archive Research Team. Retrieved 28 February 2014. Native-born Belgian Jews were first noticed at Auschwitz after 744 of them were received at the camp following deportation of 998 Jews from Mechelen on 5 August 1942. ^ Yahil, Leni (1991). The Holocaust: The Fate of European Jewry, 1932–1945. Studies in Jewish History (Reprint (trans.) ed.). Oxford: Oxford University Press. p. 393. ISBN 978-0-19-504523-9. ^ a b c Yahil, Leni (1991). The Holocaust: The Fate of European Jewry, 1932–1945. Studies in Jewish History (Reprint (trans.) ed.). Oxford: Oxford University Press. p. 435. ISBN 978-0-19-504523-9. ^ Yahil, Leni (1991). The Holocaust: The Fate of European Jewry, 1932–1945. Studies in Jewish History (Reprint (trans.) ed.). Oxford: Oxford University Press. p. 394. ISBN 978-0-19-504523-9. ^ Schreiber, Marion (2003). The Twentieth Train: the True Story of the Ambush of the Death Train to Auschwitz (1st US ed.). New York: Grove Press. p. 203. ISBN 978-0-8021-1766-3. ^ Saerens, Lieven (2008). De Jodenjagers van de Vlaamse SS. Lannoo. p. 188. ISBN 978-90-209-7384-6. ^ a b c Yahil, Leni (1991). The Holocaust: The Fate of European Jewry, 1932–1945. Studies in Jewish History (Reprint (trans.) ed.). Oxford: Oxford University Press. p. 436. ISBN 978-0-19-504523-9. ^ Saerens, Lieven (1998). "Antwerp's Attitudes towards the Jews from 1918–1940 and its Implications for the Period of Occupation". In Michman, Dan (ed.). Belgium and the Holocaust: Jews, Belgians, Germans (2nd ed.). Jerusalem: Yad Vashem. p. 194. ISBN 978-965-308-068-3. ^ Waterfield, Bruno (17 May 2011). "Nazi hunters call on Belgium's justice minister to be sacked". The Telegraph. Retrieved 26 February 2013. ^ When the Twentieth convoy arrived at Auschwitz, 70% of the women and girls were gassed immediately on arrival. Sources claim that all of the remaining women from Belgian Transport No.20 were sent to Block X of Birkenau for medical experimentation. ^ a b Persecution of Jews in Bulgaria United States Holocaust Memorial Museum, Washington, DC. ^ PRWEB (28 February 2011). "International Jewish Committee Calls on Bulgaria to Clarify Their Role in the Deportation of 13,000 Jews to Treblinka". Vocus PRWeb. Retrieved 23 June 2015. ^ a b c Holocaust Encyclopedia (10 June 2013). "Treblinka: Chronology". United States Holocaust Memorial Museum. Archived from the original on 5 June 2012. Retrieved 9 December 2013 – via Wayback Machine. Deportations from Bulgarian-occupied territory among others. ^ a b c d Rossen V. Vassilev, The Rescue of Bulgaria's Jews in World War II New Politics, Winter 2010, Vol: XII-4. ^ Michael Bar-Zohar, Beyond Hitler's grasp: the heroic rescue of Bulgaria's Jews. Holbrook, Mass. : Adams Media, 1998. ISBN 1-58062-060-4. Review. ^ Jewish Virtual Library, World War II & the Holocaust Bulgaria Virtual Jewish History Tour. ^ a b c Hugh LeCaine Agnew (2004). The Czechs and the Lands of the Bohemian Crown. Hoover Press. pp. 215, 1942. ISBN 978-0817944926. ^ a b c d e f g h NAAF Holocaust Project Timeline: 1944. NAAF Holocaust Project. ^ a b Committee on the Judiciary (20 June 2012). "Holocaust-Era Claims in the 21st Century, Hearing" (PDF). One Hundred Twelfth Congress, Second Session. United States Senate. p. 4 (8 / 196). Retrieved 6 February 2014 – via direct download 2.58 MB. ^ Bremner, Charles (2008-11-01). "Vichy gets chance to lay ghost of Nazi past as France hosts summit". London: The Times. Retrieved 2008-11-01. ^ Henley, Jon (2003-03-03). "French court strikes blow against fugitive Nazi". London: The Guardian. Archived from the original on October 12, 2007. Retrieved 2014-02-06. France condemned Brunner to death in absentia in 1954 for crimes against humanity. He is still wanted. ^ a b NAAF Holocaust Project Timeline 1943 Continued. NeverAgain.org. ^ Yitschak Kerem, Le Monde sépharade, Volume I, p. 924–933. Paris: Éditions du Seuil, 2006. ISBN 2020869926. ^ a b Steven Bowman (2002). "The Jews in Greece" (PDF). Minorities in Greece: Aspects of a Plural Society: 9 of current document (427). Archived from the original (PDF) on 1 July 2013. Retrieved 18 February 2014 – via direct download. ^ Peter Vogelsang; Brian B. M. Larsen (2002). "Deportations from the Balkans". Holocaust Education: Deportations. The Danish Center for Holocaust and Genocide Studies. Archived from the original on 16 April 2014. Retrieved 18 February 2014. ^ a b Naftali Kraus, Holocaust Period. Jewish History of Hungary. ^ Librarian (10 Sep 2006), Hungarian military in WWII. Bulletin, Senta, Serbia. ^ Naftali Kraus (2014). "Jewish History of Hungary". Porges.net. Retrieved 24 February 2014. ^ "Deportations to Killing Centers: Central Europe". Holocaust Encyclopedia. United States Holocaust Memorial Museum, Washington, DC. May 11, 2012. Archived from the original on August 16, 2012. Retrieved 24 February 2014. ^ Yad Vashem, Hungarian Jewry Archived 2013-10-21 at the Wayback Machine at Holocaust History. ^ Andrew Rawson (2015). Auschwitz: The Nazi Solution. Pen and Sword. pp. 69, 87, 123. ISBN 978-1473855410. While the numbers considerably reduced through June and July , nearly 440,000 Hungarian Jews were transported to Auschwitz in less than eight weeks; 320,000 were murdered. — Rawson, 144. Also in: S.J. ; Carmelo Lisciotto (2007). "The Destruction of the Jews of Hungary". H.E.A.R.T. Of the 381,600 Jews who left Hungary between 15 May 1944 and 30 June 1944 it is probable that 200,000 – 240,000 were gassed or shot on 46 working days. ^ a b Rebecca Weiner, Hungary Virtual Jewish History Tour Jewish Virtual Library. ^ Bridge, Adrian (1996-09-05). "Hungary's Jews Marvel at Their Golden Future". London: The Independent. Retrieved 2014-02-27. ^ Peter Vogelsang & Brian B. M. Larsen, Deportations. Archived 2014-04-16 at the Wayback Machine The Danish Center for Holocaust and Genocide Studies. ^ a b Braham, p.48; Bauer, p.197. ^ Bauer, Yehuda (1994): Jews for Sale?, Yale University Press, ISBN 0-300-05913-2. ^ a b The Mystery of the Hungarian "Gold Train" Jewish Virtual Library. ^ "Gold Train" Settlement Will Fund Services for Hungarian Holocaust Survivors; Objections, Exclusions Due August 1, 2005. ^ a b Bridget Kevane (June 29, 2011). "A Wall of Indifference: Italy's Shoah Memorial". The Jewish Daily Forward.com. Retrieved 16 April 2014. ^ a b Egill Brownfeld (Fall 2003). "The Italian Holocaust: The Story of an Assimilated Jewish Community". Jewish Fascists and Anti-Fascists. The American Council For Judaism. Retrieved 16 April 2014. ^ a b Franklin Hugh Adler (Winter 2006). "The Civilization of the Holocaust in Italy: Poets, Artists, Saints, Anti-Semites by Wiley Feinstein". Book Review. 20 (3): 518–520. Retrieved 16 April 2014. ^ Holocaust Encyclopedia (June 10, 2013). "Southern Europe". Deportations to Killing Centers. United States Holocaust Memorial Museum. Retrieved 16 April 2014. ^ Jewish Virtual Library, Netherlands (Holland): The Holocaust Era. Encyclopedia Judaica. ^ Yad Vashem, Deportation train from Westerbork, Holland Archived 2014-03-05 at the Wayback Machine. Photo Archives 43253. ^ a b Van der Boom (1 May 2007), Holocaust in the Netherlands: 'We really had no idea'. Leiden University. Review of Tegen beter weten in by Ies Vuijsje's. ^ Holocaust Encyclopedia, Westerbork. [dead link] United States Holocaust Memorial Museum, Washington, D.C.
^ Schelvis, Jules (1993). Vernietigingskamp Sobibor (in Dutch) (5th. (2004) ed.). De Bataafsche Leeuw. pp. 236ff. ISBN 9789067076296. ^ "Like a slow train coming". Expatica.com. Archived from the original on 2007-12-11. ^ Simone Gigliotti (2009). Resettlement. The Train Journey: Transit, Captivity, and Witnessing in the Holocaust. Berghahn Books. p. 55. ISBN 978-1845459277. Retrieved 21 September 2015. ^ Alfred C. Mierzejewski (Jun 19, 2003). Most Valuable Asset of the Reich: A History of the German National Railway 1933-1945. Volume 2. Univ. of North Carolina Press. pp. 78–80. ISBN 9780807825747. Retrieved 9 February 2014. ^ Hans Pottgiesser (1975) . Die Deutsche Reichsbahn im Ostfeldzug 1939 - 1944. Kurt Vowinkel Verlag. pp. 17–18. Excerpts. ^ PAP (14 October 2014). "Monument unveiled in Gdynia to victims of Nazi German expulsions" [W Gdyni odsłonięto pomnik wysiedlonych przez niemieckich okupantów]. Dzieje.pl. Archived from the original on 3 February 2016. ^ a b Piotrowski, Tadeusz (1998). Poland's Holocaust: Ethnic Strife, Collaboration with Occupying Forces and Genocide in the Second Republic, 1918-1947. McFarland. p. 22. ISBN 978-0786403714. ^ Anna Machcewicz (16 February 2010). "Mama wzięła ino chleb" [Mom took only the bread]. Historia. Tygodnik Powszechny. Archived from the original on 18 March 2012. Retrieved 31 January 2016. ^ Berghahn, Volker R. (1999). "Germans and Poles 1871–1945". in Germany and Eastern Europe: Cultural Identities and Cultural Differences (Rodopi), pp. 15-34; ISBN 9042006889. ^ "The unloading ramps and selections". Auschwitz-Birkenau State Museum. Transports of Poles from Warsaw during the Uprising there, sent to Auschwitz by way of the transit camp in Pruszków, were unloaded at the third ramp built in 1943 inside Birkenau. ^ CSRO (2010). "Pierwszy Transport do KL Auschwitz: 14 Czerwca 1940" [The First Transport]. Narodowy Dzień Pamięci Ofiar Nazistowskich Obozów Koncentracyjnych. Chrześcijańskie Stowarzyszenie Rodzin Oświęcimskich. Państwowe Muzeum Auschwitz - Birkenau. ^ Andrew Rawson (2015). Auschwitz: The Nazi Solution. Pen and Sword. p. 29. ISBN 978-1473855410. ^ Gellately, Robert (2003). The Specter of Genocide. pp. 254–257. ISBN 978-0521527507. Reviewed works: Vom Generalplan Ost zum Generalsiedlungsplan by Czesław Madajczyk. Der "Generalplan Ost". Hauptlinien der nationalsozialistischen Planungs- und Vernichtungspolitik by Mechtild Rössler; Sabine Schleiermacher. Central European History, Vol. 29, No. 2 (1996), pp. 270–274. ^ Ueberschär, Gerd R.; Müller, Rolf-Dieter (2002). "The War of Annihilation". Hitler's War in the East, 1941–1945: A Critical Assessment. Berghahn. pp. 220, 289. ISBN 978-1571812933. Madajczyk, Czesław. "Die Besatzungssysteme der Achsenmächte. Versuch einer komparatistischen Analyse". Studia Historiae Oeconomicae vol. 14 (1980): pp. 105-122 . ^ Norman Davies (1982). Polenlagers. God's Playground, a History of Poland: 1795 to the present. Columbia University Press. p. 338. ISBN 978-0199253401. Retrieved 2 February 2016. ^ Agnieszka Jaczyńska (2012). Aktion Zamosc (PDF). Pamięć.pl Nr 8/2012. OBEP IPN, Lublin: Institute of National Remembrance. 30-35 (1-5 in PDF). Archived from the original (PDF) on 28 May 2015. Retrieved 2 February 2016. ^ Czesław Madajczyk (1979), Zamojszczyzna – Sonderlaboratorium SS. Vol. 1–2. Warsaw: LSW. ^ Grzegorz Motyka. "Polacy wypędzeni" (PDF). Biuletyn IPN Nr 40 (5) / 2004. pp. 4-26 / 104 in PDF. ISSN 1641-9561. ^ Krystian Brodacki (2001-06-25). "Co z tymi napisami?". W 1942 roku w Krakowie. Nasza Witryna, reprint from Tygodnik Solidarność. Archived from the original on 14 September 2011. Retrieved 8 February 2014. ^ Michał Kubara; Beata Mamcarczyk; Marcin Paździora; Sandra Schab (2012). Sosnowiec (PDF). Katalog Zabytków Techniki Przemysłowej Zagłębia Dąbrowskiego. Zagłębiowska Oficyna Wydawnicza Publishing. pp. 84–85. ISBN 978-83-928381-1-1. Archived from the original (PDF) on 6 December 2013. Retrieved 9 February 2014 – via direct download 9.97 MB. ^ "Aktion Reinhard" (PDF). Yad Vashem Shoah Resource Center, The International School for Holocaust Studies. See: 'Aktion Reinhard' named after Reinhard Heydrich, the main organizer of the "Final Solution"; also, Treblinka, 50 miles northeast of Warsaw, set up June/July 1942. ^ "Holocaust Remembrance Day in Warsaw". Archived from the original on 26 April 2009. Retrieved 5 February 2014. ^ Kopówka, Edward; Rytel-Andrianik, Paweł, "Treblinka II – Obóz zagłady (Treblinka II Death Camp)" (PDF), Monograph, chapt. 3: ibidem, Drohiczyńskie Towarzystwo Naukowe, p. 94, ISBN 978-83-7257-496-1, archived from the original (PDF) on 2014-10-10 – via Drohiczyn Scientific Society, direct download 20.2 MB. ^ Holocaust Encyclopedia (10 June 2013). "Warsaw Ghetto Uprising". US Holocaust Memorial Museum. Archived from the original on 2 May 2012. Retrieved 25 August 2013. ^ Jacek Małczyński (2009-01-19). "Drzewa "żywe pomniki" w Muzeum – Miejscu Pamięci w Bełżcu [Trees as living monuments at Bełżec]". Współczesna Przeszłość, 125-140, Poznań 2009: 39–46. Retrieved 8 August 2013. ^ Paweł Reszka (Dec 23, 2005). "Majdanek Victims Enumerated. Changes in the history textbooks?". Gazeta Wyborcza. Auschwitz-Birkenau State Museum. Archived from the original (Internet Archive) on November 6, 2011. Retrieved April 29, 2013. ^ Holocaust Encyclopedia, "Treblinka" United States Holocaust Memorial Museum. ^ Jennifer Rosenberg (1998). "The Lódz Ghetto: History & Overview (1939 - 1945)". Jewish Virtual Library. Retrieved 8 February 2014. ^ Adam Dyląg. "Barwałd: W rocznicę tragicznych wydarzeń". Archiwum: W rocznicę tragicznych wydarzeń. Portal dwutygodnika Wolna Droga - Pismo Sekcji Krajowej Kolejarzy. Retrieved 10 February 2014. ^ J. Studnicki; et al. (2011-10-20). "1944-11-24, Barwałd Średni (śląskie)". Największe katastrofy kolejowe. Towarzystwo Kontroli Rekordów Niecodziennych. Retrieved 8 February 2014. ^ Marcu Rozen (2006). "The Holocaust under the Antonescu government". Association of Romanian Jews Victims of the Holocaust (A.R.J.V.H.). Retrieved 2014-02-27. ^ "Holocaust in Podu Iloaiei, Romania". ^ Holocaust Encyclopedia. "Norway". United States Holocaust Memorial Museum. Roundups of Norwegian Jews. Retrieved 20 January 2016. Photographs of two deportation ships: SS Donau and SS Monte Rosa, courtesy of Oskar Mendelsohn. ^ a b Markus G. Jud, Switzerland's Role in World War II at History of Switzerland. ^ Markus G. Jud, Looted Assets, Gold Transactions and Dormant Accounts at Switzerland during World War II. ^ a b Switzerland at Yad Vashem International School for Holocaust Studies. ^ NAAF Holocaust Project Timeline: 1945. Never Again.org. ^ Sybille Steinbacher, Auschwitz: A History, trans. by Shaun Whiteside, Penguin Books. ISBN 0-14-102142-X. ^ "The Krakow Ghetto". JewishKrakow.net. Archived from the original on 24 July 2011. Retrieved 7 February 2014. ^ "Memorial Radegast station". Centrum Dialogu im. Marka Edelmana w Łodzi. 2013. Archived from the original on 3 December 2013. Retrieved 7 February 2014. ^ Lucjan Dobroszycki (1984). The Chronicle of the Lodz Ghetto, 1941-1944. Yale University Press. pp. 514–515. ISBN 978-0300039245. ^ "Die Niederländische Bahn und die Judendeportatiopnen" [The Dutch Railways and the deportation of Jews]. Der Centraal Joods Overleg, Amsterdam. Neue Zürcher Zeitung. 19 October 2005. Retrieved 4 February 2014. ^ "Holocaust Deportation Exhibit Denied Access to Berlin Central". Deutsche Welle. 8 April 2008. Retrieved 4 February 2014. Following story: "Remembrance train banned from station". The Guardian, 11 April 2008. ^ Catherine Hickley (April 8, 2008). "Deutsche Bahn `Embarrasses' Berlin by Hampering Holocaust Show". Bloomberg, Berlin. ^ Spiegel No. 43, 23 October 2006. ^ DW staff (2008-01-24). "Nazi Death Train Exhibit Opens in Berlin Station". Deutsche Welle. Archived from the original on 5 April 2008. Retrieved 5 February 2014. ^ a b c d Marrus, Michael R. (2011). "Chapter 12: The Case of the French Railways and the Deportation of Jews in 1944". In Bankier, David; Michman, Dan (eds.). Holocaust and Justice. Berghahn Books. ISBN 978-9-65308-353-0. ^ a b c d Baume, Maïa De La (25 January 2011). "French Railway Formally Apologizes to Holocaust Victims". The New York Times. Retrieved 26 October 2012. ^ "California set to force France's national rail service to reveal its Holocaust role as part of bid for $45m contract". Daily Mail. London. 1 July 2010. Retrieved 15 November 2012. ^ a b c d Shaver, Katherine (7 July 2010). "Holocaust group faults VRE contract". The Washington Post. Retrieved 15 November 2012. ^ a b "French railways win WWII appeal". BBC. 27 March 2007. Retrieved 16 November 2012. ^ CBC News (7 June 2006). "French railway must pay for transporting family to Nazis". Retrieved 15 November 2012. ^ Canellas, Claude (27 March 2007). "Court quashes SNCF Nazi deportations ruling". Reuters. Retrieved 15 November 2012. ^ a b Zeitvogel, Karin (20 May 2011). "US governor signs Holocaust disclosure law". European Jewish Press. Archived from the original on 14 April 2013. Retrieved 16 November 2012. ^ a b Witte, Brian (19 May 2011). "Md. governor signs bill on company's WWII role". Businessweek. Archived from the original on 12 March 2016. Retrieved 16 November 2012. ^ Samuel, Henry (30 August 2010). "SNCF to open war archives to California". The Telegraph. London. Retrieved 16 November 2012. ^ Weikel, Dan (2 October 2010). "Schwarzenegger vetoes bill requiring rail firms interested in train project to disclose WWII-era activities". Los Angeles Times. Retrieved 16 November 2012. ^ Schofield, Hugh (13 November 2010). "SNCF apologises for role in WWII Jewish deportations". BBC News. Retrieved 15 November 2012. ^ Ganley, Elaine (14 November 2010). "SNCF, French Railroad, Apologizes For Holocaust Role Before Florida Bid". The Huffington Post. Retrieved 16 November 2012. ^ Gigliotti, Simone (2009). The Train Journey: Transit, Captivity, and Witnessing in the Holocaust. Berghahn Books. ISBN 978-0-85745-427-0. Dawidowicz, Lucy S. (1986). The War Against the Jews, 1933–1945. New York: Free Press. ISBN 978-0-02-908030-6. Hilberg, Raul (2003). The Destruction of the European Jews. New Haven, Conn.: Yale University Press. ISBN 978-0-300-09557-9. Kranzler, David (2000). The Man who Stopped the Trains to Auschwitz: George Mantello, El Salvador, and Switzerland's Finest Hour. Syracuse, N.Y.: Syracuse University Press. ISBN 978-0-8156-2873-6. Winner of the 1998 Egit Prize (Histadrut) for the Best Manuscript on the Holocaust. Gurdus, Luba Krugman (1978). The Death Train: A Personal Account of a Holocaust Survivor. New York: National Council on Art in Jewish Life. ISBN 978-0-89604-005-2. Hedi Enghelberg (1997). "The Trains of the Holocaust". Enghelberg.com, revised. Wikimedia Commons has media related to Railway use for Holocaust. This page was last edited on 8 April 2019, at 22:42 (UTC).